This web site on Francis Paul Schwert is under development. 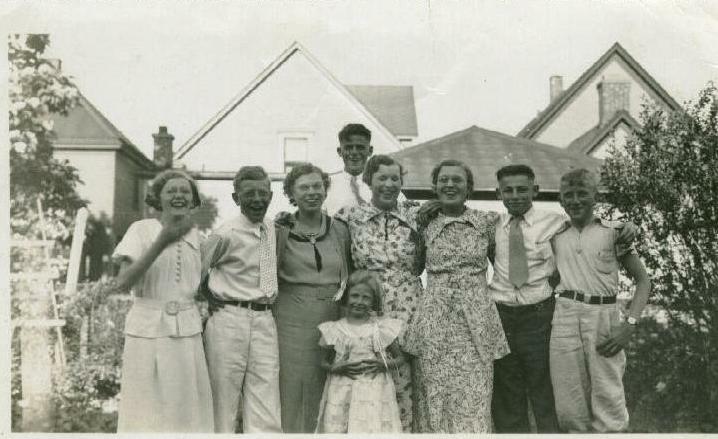 We welcome your input, stories, photographs, documents, and other resources. 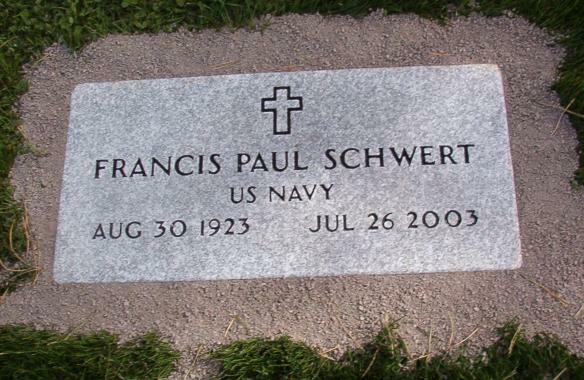 Francis Paul Schwert was born in Buffalo, NY, on August 30, 1923. He attended Blessed Trinity School and Seneca Vocational High School. Fran served in the U.S. Navy during World War II as an electrician's mate second class on the USS Yosemite, a destroyer tender. 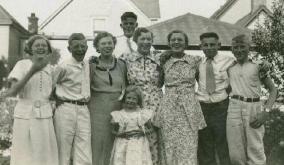 Following the war, Fran married Mary Frances Measer, daughter of Stephen and Hazel Measer. For 40 years, Fran was an electrician at Greater Buffalo Press, retiring in 1986. Fran enjoyed collecting stamps, watching baseball, and playing golf. Francis died on July 26, 2003, at the age of 79. 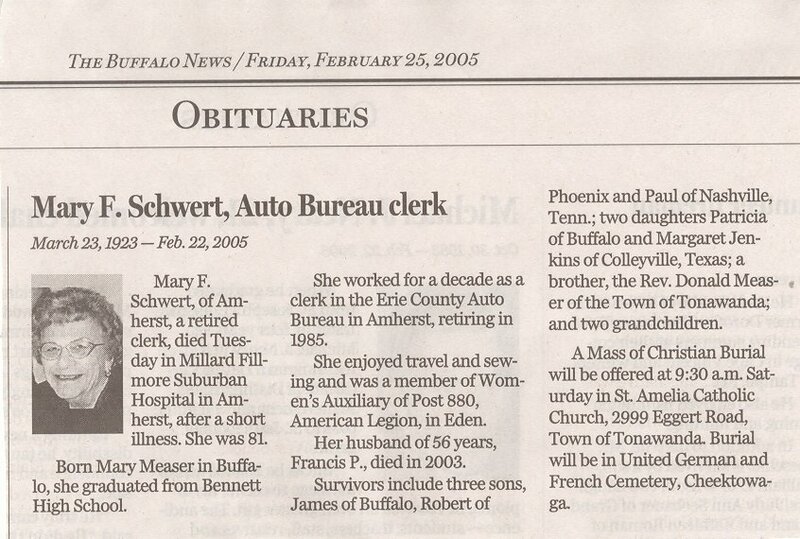 Mary died on February 22, 2005, at the age of 81. 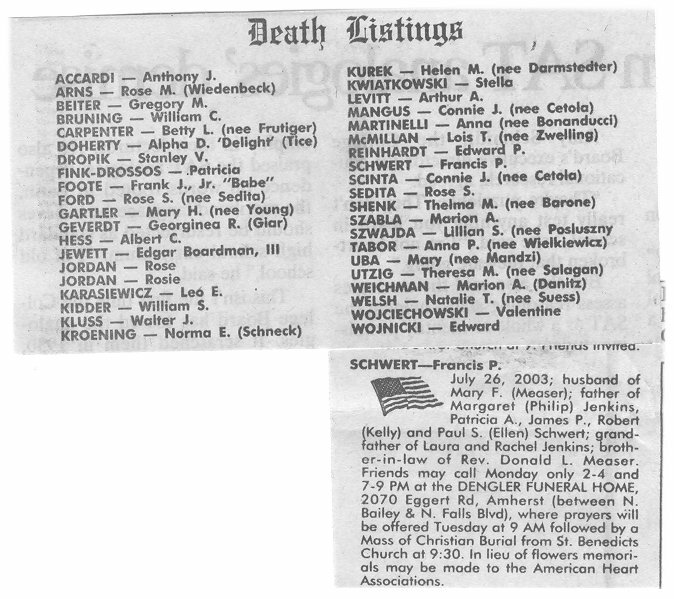 Both are interred in Lot 114, Section 20, United German & French Cemetery (Pine Hill), Cheektowaga, NY. Mary Rose (née Wagner) Schwert: Born 1884; died 1944. Margaret (née Schwert) Jenkins: Living. 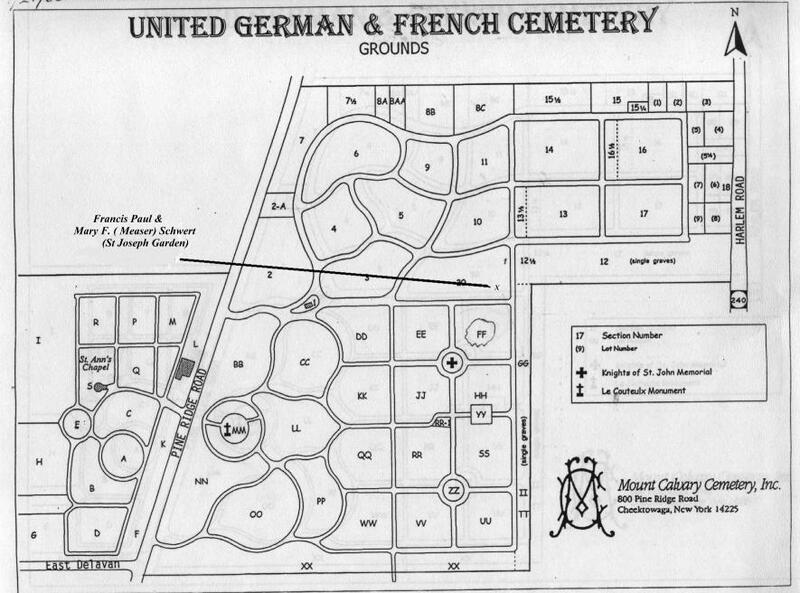 General location of the gravesites of Francis Paul Schwert and Mary Frances (née Measer) Schwert, Lot 114, Section 20, United German & French Cemetery (Pine Hill), Cheektowaga, NY. A map to locate the gravesite is available here. 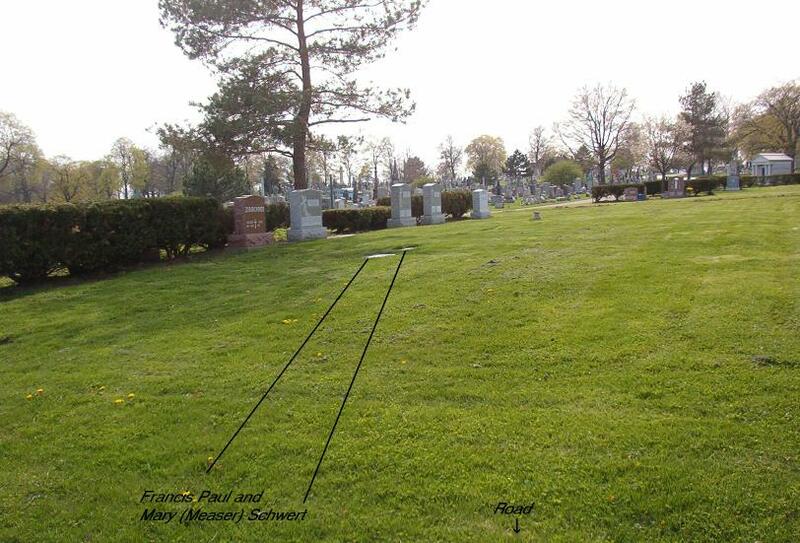 General location of the gravesites of Francis Paul Schwert and Mary Frances (née Measer) Schwert, Lot 114, Section 20, United German & French Cemetery (Pine Hill), Cheektowaga, NY. A map to locate the gravesites is available here. 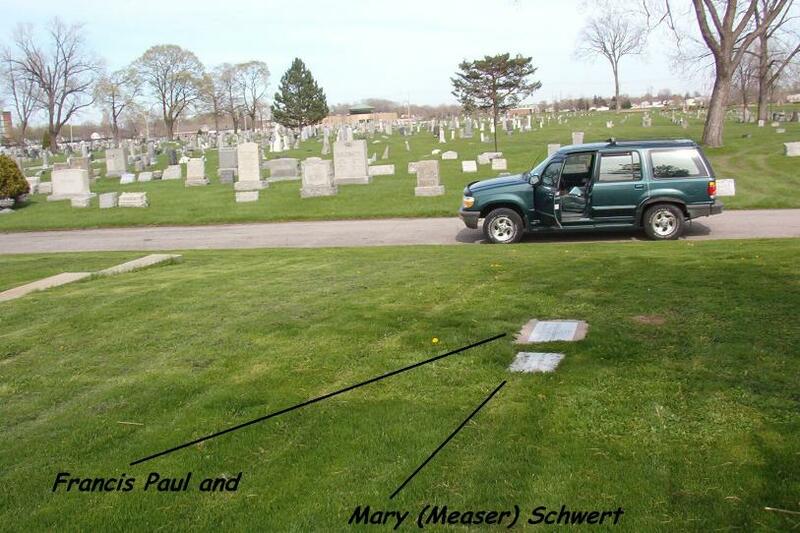 Grave of Francis Paul Schwert, Lot 114, Section 20, United German & French Cemetery (Pine Hill), Cheektowaga, NY. 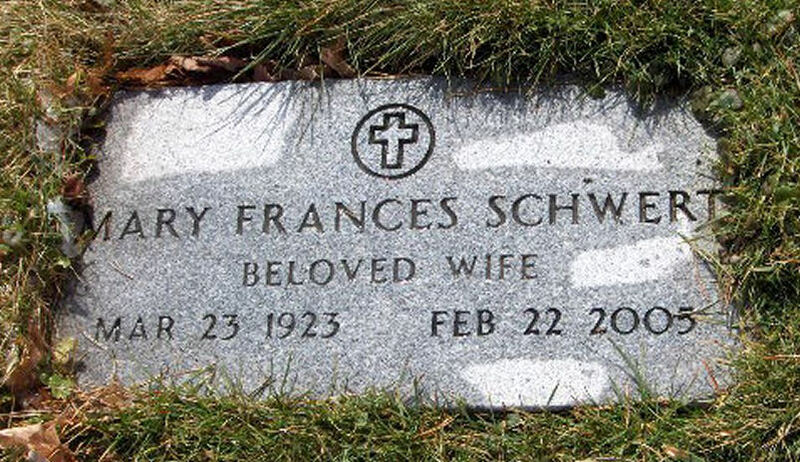 Grave of Mary Frances (née Measer) Schwert, Lot 114, Section 20, United German & French Cemetery (Pine Hill), Cheektowaga, NY. 1930 Census Records: Schwert: Census records for Francis Paul Schwert, and his parents Paul and Mary Rose (née Wagner) Schwert. 1930 Census Records: Measer #1: Census records for Mary Frances Measer, and her parents Stephen and Hazel (née ???) Measer. 1930 Census Records: Measer #2: Census records for Mary Frances Measer, and her parents Stephen and Hazel (née ???) Measer. 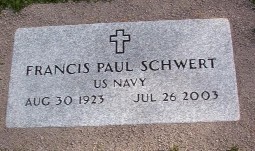 Obituary: Francis Paul Schwert, died July 26, 2003. 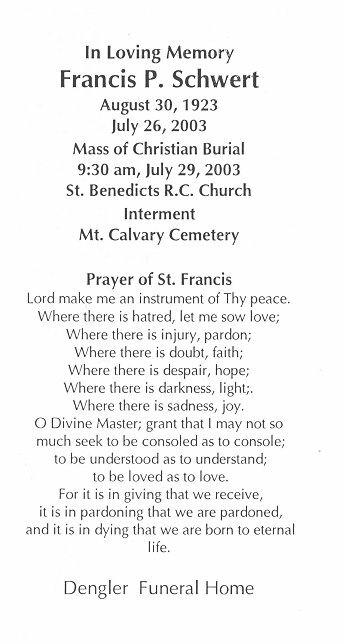 Funeral Mass Card: Francis Paul Schwert; born August 30, 1923; died July 26, 2003. 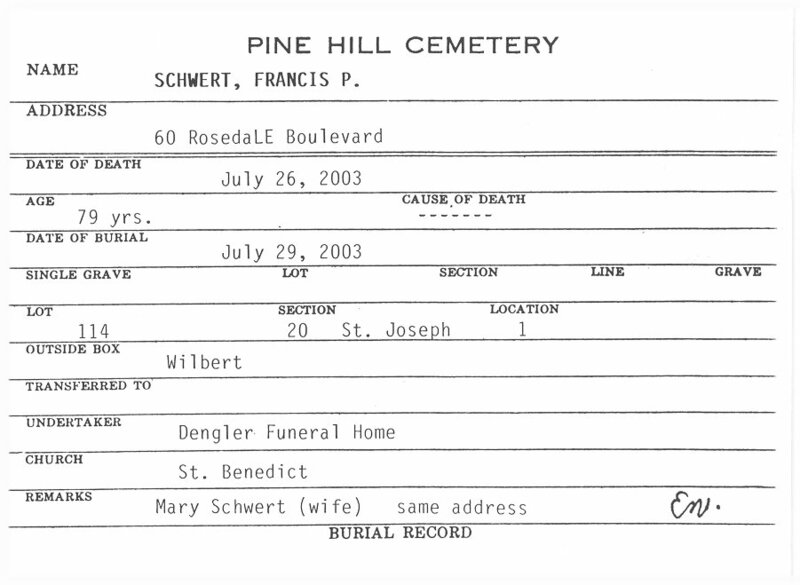 Interment Record: Francis Paul Schwert, Lot 114, Section 20, United German & French Cemetery (Pine Hill), Cheektowaga, NY. 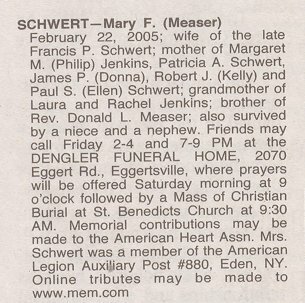 Obituary: Mary Frances (née Measer) Schwert, died February 22, 2005. 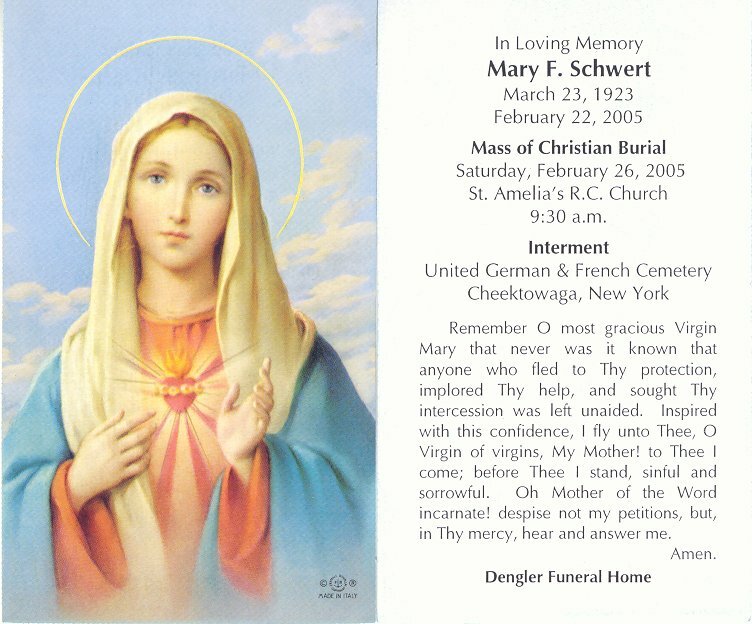 Funeral Mass Card: Mary Frances (née Measer) Schwert, died February 22, 2005, mass of Christian burial, February 26, 2005.